Each Winter season there is a specific coat trend that sticks out more than any other. This year we are talking the Teddy coat. With Gucci taking a lead on the Faux Fur front it seems there’s no accounting for the number of Faux Fur and Teddy coats seen both on high streets and the high end boutiques. 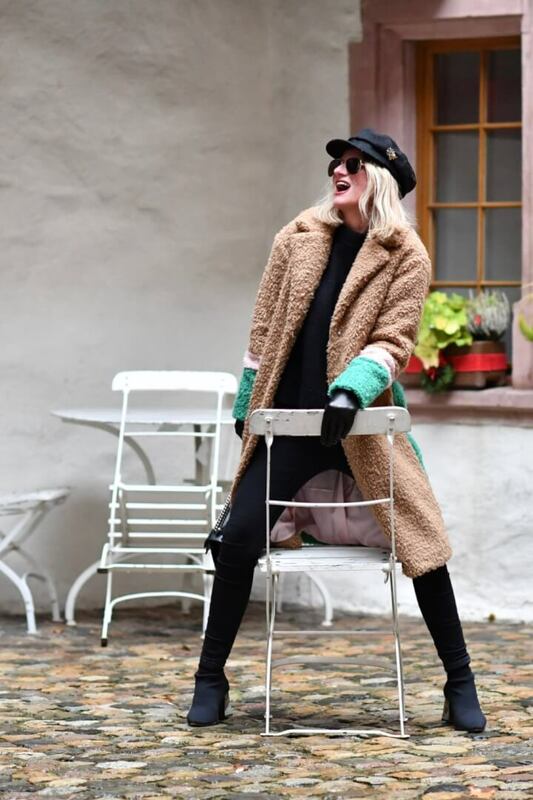 FunkyForty prognosis is that this is one trend that is in it’s infancy – now is the time to buy a Teddy coat that will see you through several years to come. Keep reading for more about the must shop coat for Winter 2017! More than just the Teddy coat however, this season is also about colour blocking. Put the two together and you have the perfect must have coat for Winter 2017. I found this one at TopShop, and instantly fell in love. Having tried out different styles I decided it definitely looks best teamed up with all black underneath. These pictures were taken at a very special spot as it is where my hubby and I said our wedding vows (Schloss Pratteln). 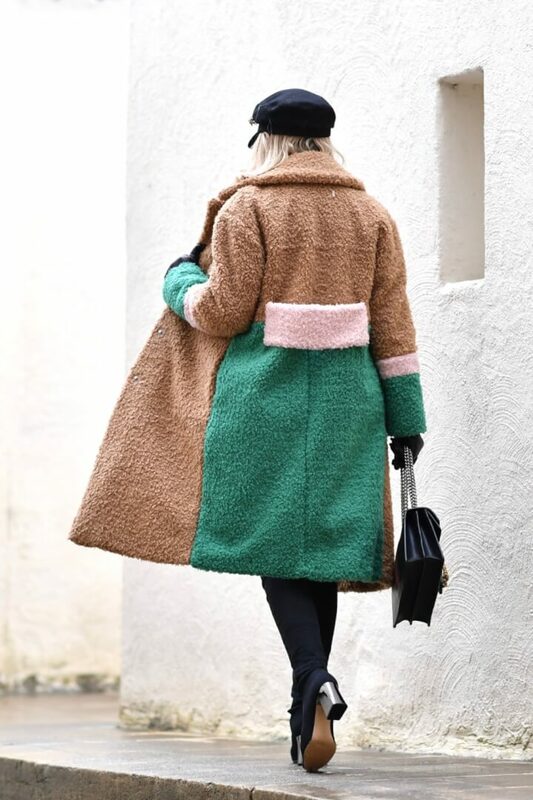 The colour blocking at the back of this coat is fun. A bit of a surprise for people who initially only see you from the front. A small selection of Teddy and Faux Fur coats you might like to treat yourself to for Christmas – smile! Hope Christmas preparations are going ok for you. Remember sometimes the imperfect can be even nicer than the perfect – smile! and a huge thanks from the bottom of my heart for all your support throughout the year. I will officially be taking a one week break and look forward to seeing you after Christmas! Thanks dear Sasha. Australia is such a lovely place for Christmas. I wish you and your family the most wonderful time dear. Well that is a special place then! Great coat! Yes it really is… Thank you Nancy. Thanks Sue, so glad you like it 😉 Have a wonderful New Years Eve! Top outfit with great coat and fantastic boots! 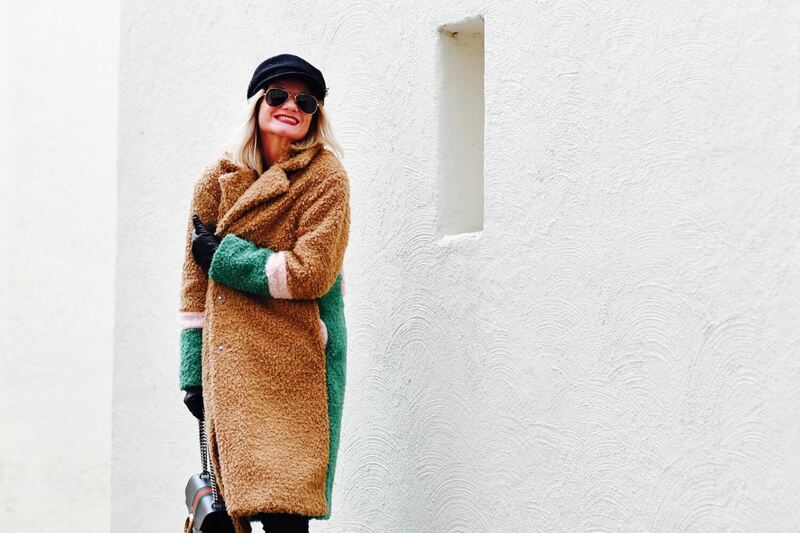 Gorgeous coat Yvonne! It looks very cosy and warm. Thanks for linking up! Happy New Year! Thank you Emma, wish you a wonderful New Years Eve!